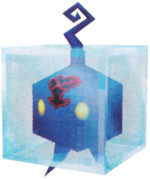 The Icy Cube is an Emblem Heartless that is found in Kingdom Hearts II and Kingdom Hearts 358/2 Days. It resembles a large ice cube and is controlled by the Blizzard Lord. Whenever Blizzagun is used on the Blizzard Lord, it explodes into a group of Icy Cubes. The Icy Cube's counterpart is the Fiery Globe. The Icy Cube's body is blue and spherical, with two featureless legs sprouting out of its bottom and a twisted antenna coming out of the top of its head. 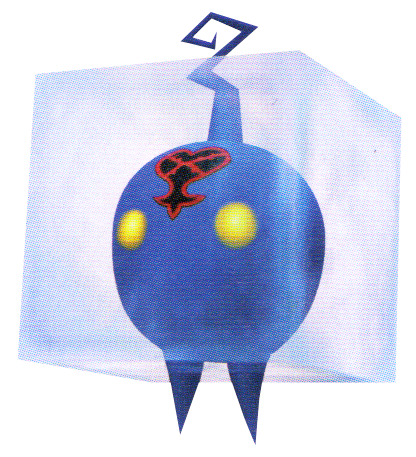 Its Heartless emblem is present on its forehead between its two glowing, yellow eyes. The Heartless's body is almost entirely frozen in a block of ice, save for the tips of its legs and antenna. Icy Cubes are very small Heartless. The Icy Cube's name is a reference to its shape and attribute, as well as real-world ice cubes. It is also a contrast to the Fiery Globe's name. This page was last edited on 2 May 2018, at 20:29.